By now, you've heard of Tropical Storm Ketsana/Ondoy, which has ravaged the Philippines with flooding in Manila and the surrounding region. The death toll, still climbing, has risen to at least 140, with 32 missing, and tens of thousands left homeless: 140 die in Philippine storm, toll expected to rise. The storm dumped more than a month's worth of rain in just 12 hours, fueling the worst flooding to hit the country in more than 40 years. Overwhelmed officials called for international help, warning they may not have sufficient resources to withstand another storm predicted to hit the Philippines as early as Friday. Authorities expect the death toll to rise, as recuers try to get to villages blocked off by floating cars and other debris. Troops, police and volunteers have already rescued more than 7,900 people, but unconfirmed reports of more deaths abound. 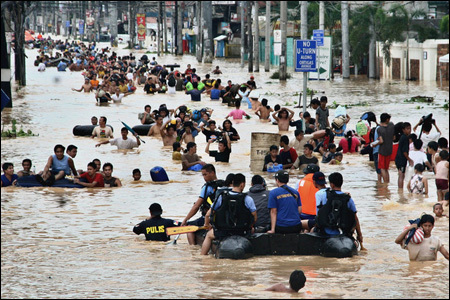 More here: Philippines 'overwhelmed' as new storm threatens after Ketsana. Donations for rescue and relief can be made to the Philippine National Red Cross.